For its efforts, the University once again has earned a Green Fleet Award; this is the fourth consecutive year for this distinction. 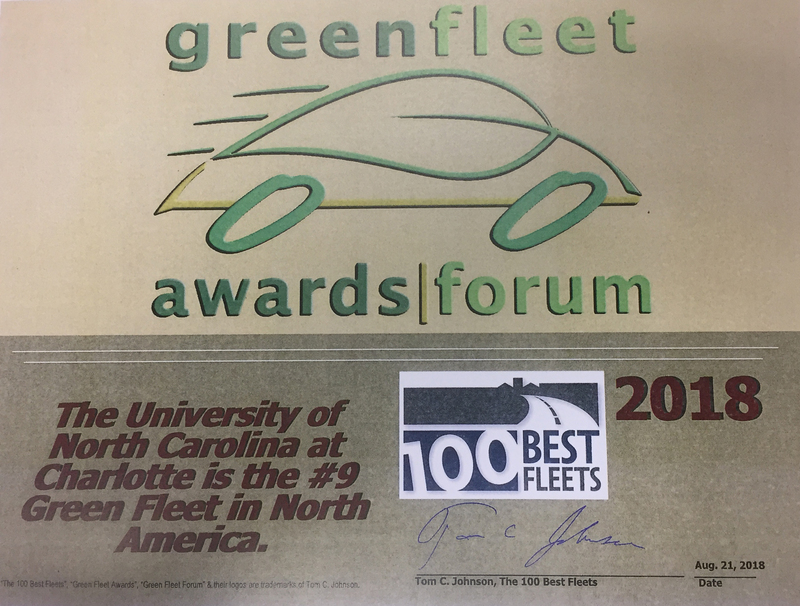 UNC Charlotte’s automotive fleet is among the top 50 sustainable fleets across North America, ranking ninth, which advanced the city of Charlotte to 47th place. The fleet was the only university to win this year’s award. This annual distinction highlights the fleet’s efforts to improve sustainability; the University ranked 15th in 2017, 36th in 2016 and 24th in 2015. For the past two years, the fleet was recognized among the 100 Best Fleets program, a parent to the Green Fleet Award. The focus on establishing an environmentally friendly campus fleet began in 2004 with direction from Phil Jones, former associate vice chancellor for facilities management, when the University purchased its first electric vehicle, which is still operational on campus. Today, UNC Charlotte has one of the largest electric fleets in North Carolina. More than half of the campus-wide fleet of 515 vehicles are flex-fuel or electric vehicles, resulting in significant decreases in harmful emissions by campus vehicles. Flex-fuel vehicles run on E85 ethanol, a blend of 85 percent ethanol and 15 percent gasoline, which reduces pollutant levels versus regular gasoline. A major component of UNC Charlotte’s sustainable fleet is the recycling program in place for used automotive items. Used motor oil, antifreeze, oil filters and tires are all recycled properly and have factored into UNC Charlotte winning Green Fleet Awards. Future plans focus on the continued increase of electric vehicles in the fleet, the goal is to reach 25 percent in two years, 30 percent in five years and up to 50 percent in 10 years. Currently, 23 percent of the campus fleet is electric. Chris Facente, automotive fleet supervisor, attributes the fleet’s progression in sustainable practices to his hard-working team and the excellent leadership before him.